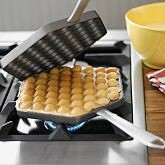 Martha Stewart mentioned in passing on making crepes, a handy Japanese kitchen tool that evenly dispenses oil for cooking. baking, or grilling. This handy device dispenses just the right amount of oil, not too much. not too little, all while keeping your hands grease free! It’s called a OYATSULAND or Japanese Oil Brush Set. Fiber strings not only dispense oil evenly but can get into every nook & cranny of a muffin pan, aebleskiver pan, or any pan to create a natural nonstick surface. Reusable and relatively inexpensive. this a great little gift for the chefs in your family and a great stocking stuffer! Best prices at the following merchants: Amazon from $4.25-$4.99+sh. Webichi.com $6.49 +sh. Clay Pot Cooking Without The Pot! What is old, is new again or so it seems so–even in cooking. Williams Sonoma is selling sheets of clay to cook your favorite meats in with the main advantage that your guests will ooh and aah at this unique presentation. Although this method is quite old, it has had mixed results from fabulous to undercooked. 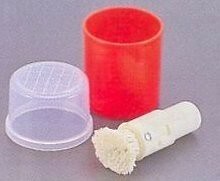 The kit sells for $14.99 for one time use, personally MarkdownMom recommends checking out prices of the reusable clay pots. Want to be adventurous and find your own source of clay? Just make sure it’s food safe. The most economical way to buy tea is in bulk. Usually it is fresher andthe cost per ounce is less. The downside is steaming the tea to extract the full flavor and straining out the leaves. Now you can do both, a twofer, or two for tea with the Kamjove Press Art Tea Cup. Like the French Press, this is a great way to brew a cuppa. With a patented press valve you can control strength, no leaking when you stop pressing, and stainless steel double filter nets make this item a must have for the tea drinker. Prices range from $20-$25, at various web sites including Ebay™, and local Asian specialty stores such as Noodles & Company. Okay, La bor Day Weekend spells the end of summer and perhaps the last family summer picnic. Hot dogs, burgers, potato salad and more. Sounds heavy, right? Where does dessert come in–yeah, I know there’s always room for jello, but come on that squiggly mixture can turn into a gloppy mess in hot weather, and it’s not that exciting. What would you say to a frozen delicious dessert that can rival your favorite gelato, frozen yogurt, is super healthy and takes minutes to prepare? Yonanas is a new kitchen gadget that takes those bananas turning brown and turns them into a delicious soft ice cream or fruit popsicle. Great for the family and cost effective, too. $49.95+sh, best price on shipping and handling at HSN. Without a heavy dessert to slow you down, you can scoop all those Labor Day Weekend bargains! Slice, Dice, Scoop, and Scrape! Sounds kind of gruesome, but to avid kitchen gadgeteers the thought of being able to do 4 prep jobs with one tool spells must-have! The Kuhn Rikon set of 2 Scrape and Scoop nonstick knives makes short work with blades made from Japanese high carbon stainless steel. 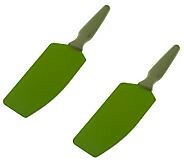 Nonstick coating in 1 of 7 popular colors insure a speedy clean-up. 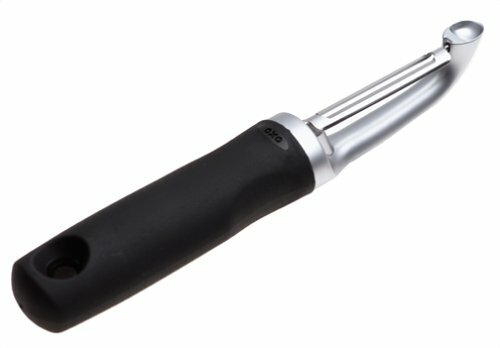 Wide chef knife comes with a knife cover for safety and protection. Get a set of 2 at QVC for $19.86+sh. 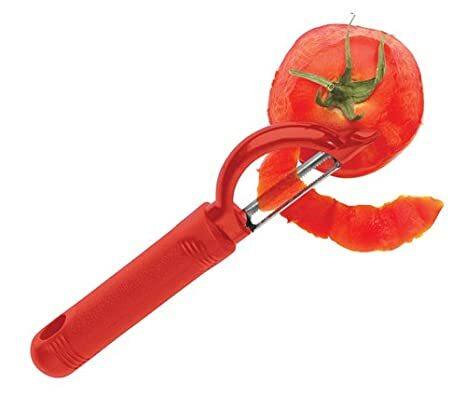 Kuhn Rikon makes it easy to be knife happy! Every so often, okay more often than not, someone takes an idea and improves on it. Recently, Cook’s Country TV editor and host Chris Kimball appeared on The Today Show with Kathie Lee Gifford and Hoda with a list of 6 new improved kitchen gadgets. View these kitchen must-haves. Most bakers know that you shouldn’t over mix batter for quick breads, muffins, scones and biscuits–but how can you tell if it is mixed too much? Well, electric mixers make it easy to incorporate all ingredients evenly, but mixers on certain bake goods can over mix and the results can be a dense, dry and flavorless muffin, or tunnels created in baked goods from an excess of air bubbles beaten into the batter. So, to get the best results ingredients should be blended just enough to blend the wet and dry ingredients together. But that’s so hard, I mean all that hand work, right? And how do you get rid of the lumps? Don’t despair, the ingenious Wilton® Batter Blender comes to the rescue! 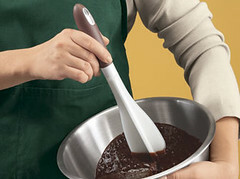 The silicone hand blender can mix the heaviest batter and it’s scalloped tips can break up any lumps and will scrape the bowl clean–beside, it’s dishwasher safe. At Amazon $9.63 or The HomeMarket Place, $11.99.